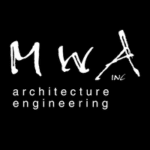 MWA is the experienced firm with youthful energy and a proven track record of over two thousand projects since our inception in 1985. We take pride in maintaining a professional presence while operating as a casual, down to earth company with a sense of humor. Our office is a fun think tank environment with dogs asleep on the floor and music thumping. We play hooky on powder days. We choose to live in the mountains for a high quality of life. Our happiness shows in our work.